I was sitting on the sidewalk today whilst my kids played in the road and was just admiring the top of this tree against the blue sky. I have Oakley prescription lens sunglasses that are polaroid. And the contrast and saturation was fantastic. So I went inside and got my camera with the polaroid filer ( I use Singh Ray filters – expensive but brilliant) and snapped away. There is a free photo editing tool out there called Picmonkey.com. Seems they are reincarnation of Picnik. They have a Warhol effect. I clicked on it and the default is yellow and blue. But I switched it to Blue and white. 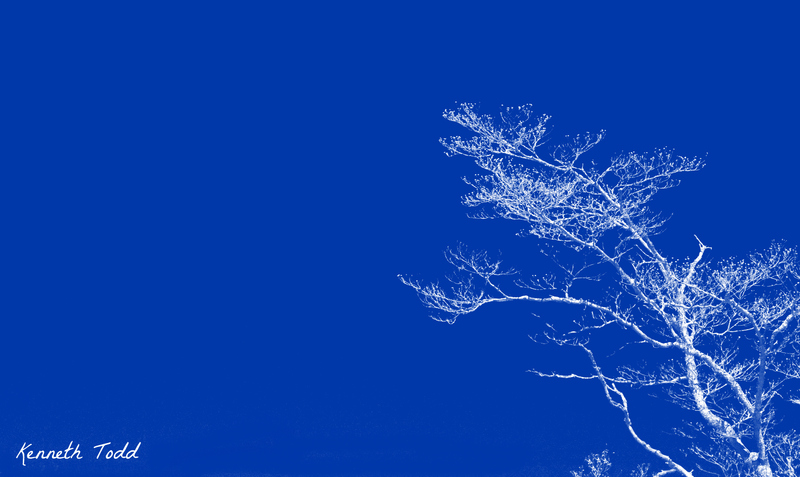 It just evened out the saturated blue sky and soften the white branches. It reminds me of those Japanese painting. I like it and hop you do too. Have a wonderful day and weekend, whether you celebrate Easter or not. Enjoy. Thanks for your helpful tutorial. Very lovely. Picmonkey is a cool site; lots of new features now. I love this effect. Would make a really nice writing paper.